Crunchy Granola Baby: What's Next? . . .
What's Next? . . . I don't even HAVE a kid and I miss your shop! So glad I got to be part of it, however round-about. I wish you nothing but the best in your future endeavors. May our paths cross again. Thank you so much for all of that you've done for families in Salem. And thank you for mentioning me, I hope to be resource and in service to parents who want to live naturally on the North Shore. To say CGB will be missed is an understatement, but time with family is priceless. I'm sorry to hear that CGB will no longer exist in an online form, but I'm glad that you'll have that time and energy then available to spend on your family and other pursuits. On the last day the store was open, I told you that even though the store didn't survive, that just meant there was a perhaps a different platform (than retail) waiting for your passions. In terms of a passion for natural living and parenting, I've thought about what a shame it is for new families to lose both the resource of CGB and Mothering at the same time. The final issue of Mothering was digital only, and I'm not sure if you read it, but it's letter from Peggy O'Mara perfectly expressed what I was trying to say, and I think there was a beautiful kismet in that. In talking about the sadness of the magazine not surviving the economic downturn, she wrote, "It forces me to ask myself, 'Am I in the magazine business or the information business?' If I am in the business of providing information and inspiration to parents, then does it ultimately really matter what forms that information and inspiration take?" She then goes on to explain how her goals and passions for the ideas within the magazine will live on in other formats and ventures. I just want you to know that in the end of CGB as an online presence, I definitely don't foresee this as the end of your promoting natural parenting, just an eventual redirect. Everyone I've heard talking about the store has expressed the same sentiment. Whatever path you choose to follow in promoting this way of life, there are so many people cheering you on and who are so grateful for the gifts of wisdom you've already given them. I know for a fact that I wouldn't be the mother I am today if it weren't for you and CGB. Thank you so much for that. 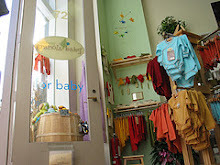 Sure, Crunchy Granola Baby is a shop specializing in organic and natural items for babies and young children. But we’re also a shop that prides itself on balancing quality products with quality customer service. If you’re interested in cloth diapers, come in for a demonstration. If you’re curious about babywearing, come try our wraps and slings. And rest assured that all of our products have been thoroughly researched and tested. Only the best for our customers! And because we love our customers so much, we’re also a community resource for North Shore families - a place to visit if you need to feed, nurse or change your little one. And if you need to play, CGB can help. Just ask any of our “regulars!” We’ve got couches for mom and dad, lead-free and non-toxic toys for the kids, and great conversations for all. But we do so much more than just talk and play – we work hard to organize family and community-oriented events. In the past, we’ve hosted composting workshops to raise money for local schools, organized film screenings with Cinema Salem, and played host to a Community Supported Agriculture (CSA) program. Check out our calendar for upcoming events, classes and workshops. Salem is a great city and since opening in 2006, we've been proud to be part of such a historical, yet innovative community. We're Twittering Away! Follow Us!